Download "Storage Made Easy. 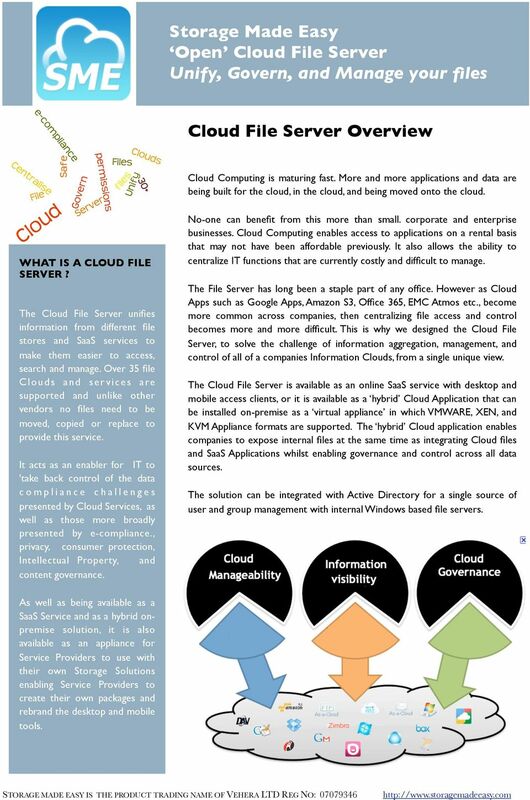 Cloud File Server Overview"
1 Storage Made Easy Investor Open Cloud Newsletter File Server Unify, Govern, and Manage your files Cloud File Server Overview Cloud Computing is maturing fast. More and more applications and data are being built for the cloud, in the cloud, and being moved onto the cloud. WHAT IS A CLOUD FILE SERVER? The Cloud File Server unifies information from different file stores and SaaS services to make them easier to access, search and manage. Over 35 file Clouds and ser vices are supported and unlike other vendors no files need to be moved, copied or replace to provide this service. It acts as an enabler for IT to 'take back control of the data compliance challenges presented by Cloud Services, as well as those more broadly presented by e-compliance., privacy, consumer protection, Intellectual Property, and content governance. No-one can benefit from this more than small. 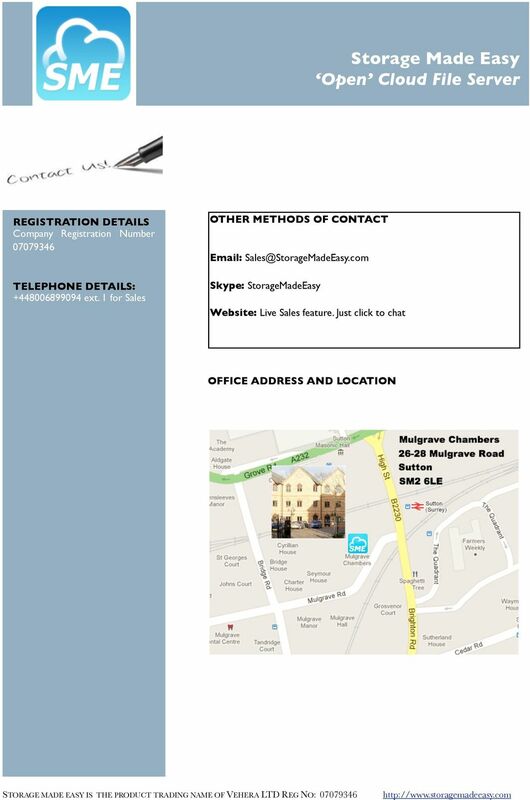 corporate and enterprise businesses. Cloud Computing enables access to applications on a rental basis that may not have been affordable previously. It also allows the ability to centralize IT functions that are currently costly and difficult to manage. The File Server has long been a staple part of any office. However as Cloud Apps such as Google Apps, Amazon S3, Office 365, EMC Atmos etc., become more common across companies, then centralizing file access and control becomes more and more difficult. 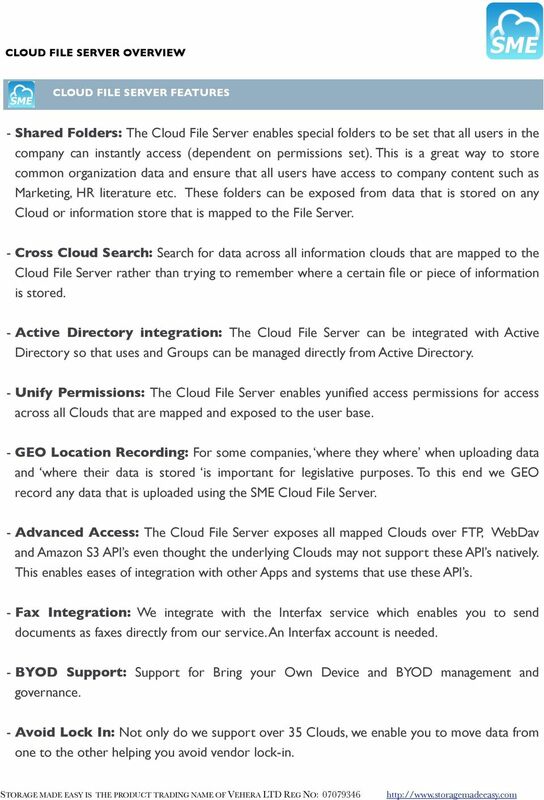 This is why we designed the Cloud File Server, to solve the challenge of information aggregation, management, and control of all of a companies Information Clouds, from a single unique view. The Cloud File Server is available as an online SaaS service with desktop and mobile access clients, or it is available as a hybrid Cloud Application that can be installed on-premise as a virtual appliance in which VMWARE, XEN, and KVM Appliance formats are supported. The hybrid Cloud application enables companies to expose internal files at the same time as integrating Cloud files and SaaS Applications whilst enabling governance and control across all data sources. The solution can be integrated with Active Directory for a single source of user and group management with internal Windows based file servers. As well as being available as a SaaS Service and as a hybrid onpremise solution, it is also available as an appliance for Service Providers to use with their own Storage Solutions enabling Service Providers to create their own packages and rebrand the desktop and mobile tools. 2 - Access and Manage files on any Cloud: Amazon S3, RackSpace, SkyDrive, SharePoint / Office 365, Google Apps, Google Drive, Box, DropBox, EMC Atmos, PogoPlug + more. Over 30 file clouds and SaaS services are supported. 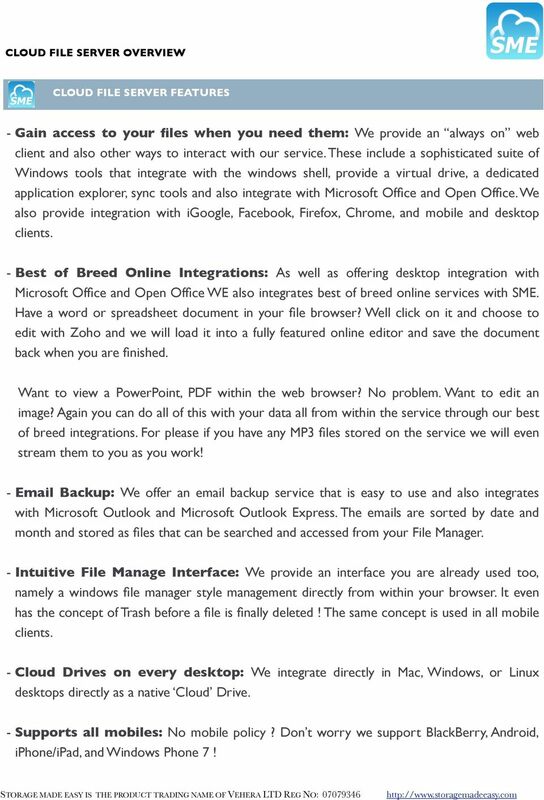 All are available to be accessed and managed in a unique Cloud File System. - Public / Private information management: Can work in combinations with onpremise and public cloud storage and SaaS information stores. - Product combines File Server / Intranet / Collaboration: The Cloud File Server provides a unique workspace that is not just access to file information but uses data as a means to collaborate and integrate with other services. - Advanced Cloud Safe features: You can choose to have your data stored in a nominated Primary Cloud and have it automatically backed up to a Backup Cloud to ensure your data is always available when you need it. If the Primary is down, we will get your data from the backup. - Never send another file in an attachment: The Cloud File Server provides advanced file sharing features which includes secure sharing files over . Each file also has its own unique URL. File share that can be set to expire after a number of days, for further security - Secure your Files: All files can be made secure using encryption, even if the underlying storage cloud does not support encryption. Only the user who assigned the key knows it. It is not stored on our service. Any shared files that are encrypted will need to have a key entered for file access. - Use more than one cloud: Unlike other solutions we don t mandate a data store or restrict you to just one cloud. Several and even multiple instances of the same cloud or service can be mapped to the Cloud File Server. All data is seen in a unique single view. Of course if a storage service is also required then we one can either be provider or recommended. 3 - Gain access to your files when you need them: We provide an always on web client and also other ways to interact with our service. These include a sophisticated suite of Windows tools that integrate with the windows shell, provide a virtual drive, a dedicated application explorer, sync tools and also integrate with Microsoft Office and Open Office. We also provide integration with igoogle, Facebook, Firefox, Chrome, and mobile and desktop clients. - Best of Breed Online Integrations: As well as offering desktop integration with Microsoft Office and Open Office WE also integrates best of breed online services with SME. Have a word or spreadsheet document in your file browser? Well click on it and choose to edit with Zoho and we will load it into a fully featured online editor and save the document back when you are finished. Want to view a PowerPoint, PDF within the web browser? No problem. Want to edit an image? Again you can do all of this with your data all from within the service through our best of breed integrations. For please if you have any MP3 files stored on the service we will even stream them to you as you work! - Backup: We offer an backup service that is easy to use and also integrates with Microsoft Outlook and Microsoft Outlook Express. The s are sorted by date and month and stored as files that can be searched and accessed from your File Manager. - Intuitive File Manage Interface: We provide an interface you are already used too, namely a windows file manager style management directly from within your browser. It even has the concept of Trash before a file is finally deleted! The same concept is used in all mobile clients. - Cloud Drives on every desktop: We integrate directly in Mac, Windows, or Linux desktops directly as a native Cloud Drive. - Supports all mobiles: No mobile policy? Don t worry we support BlackBerry, Android, iphone/ipad, and Windows Phone 7! 4 - Contact Backup: Backup contacts from over 30 and social sites including Facebook and LinkedIn. We also provide Outlook integration with our windows tooling so that Outlook contacts can be backed up. - Collaboration Groups: Each user has the ability to create groups in which people outside the company can be invited to share content. Each member can, if required, be given permission to share content with the group and the group can be configured for all members to see each other, or not. When new files are uploaded to the group all members receive an automated informing them of new content. It is a great way to deal with partner networks, or geographically distributed working groups. - Backup: We offer an backup service that is easy to use and also integrates with Microsoft Outlook and Microsoft Outlook Express. The s are sorted by date and month and stored as files that can be searched and accessed from your File Manager. - Cloud Governance / File Event Auditing: The Cloud Administrator can setup the Cloud File Server to audit log all file events for historical, and legislative purposes. A requirement for certain professions who wish to use the Cloud. Access can also be restricted to specific IP addresses or IP address ranges. 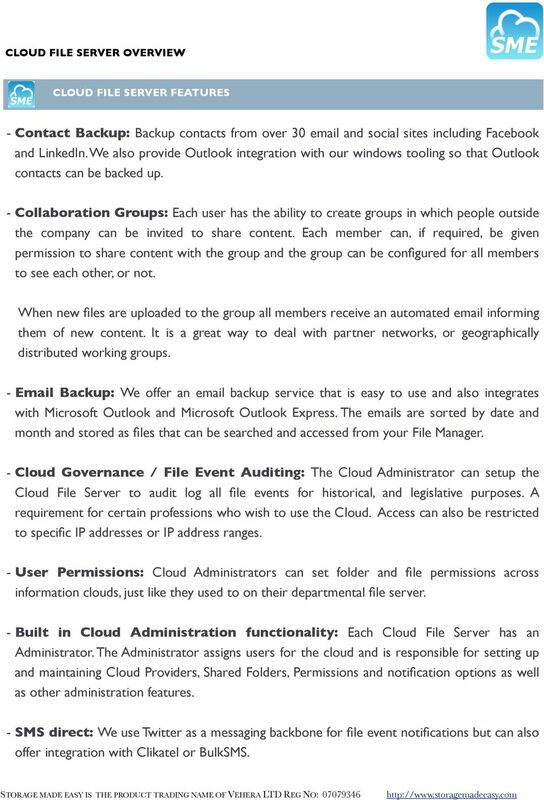 - User Permissions: Cloud Administrators can set folder and file permissions across information clouds, just like they used to on their departmental file server. - Built in Cloud Administration functionality: Each Cloud File Server has an Administrator. The Administrator assigns users for the cloud and is responsible for setting up and maintaining Cloud Providers, Shared Folders, Permissions and notification options as well as other administration features. - SMS direct: We use Twitter as a messaging backbone for file event notifications but can also offer integration with Clikatel or BulkSMS. 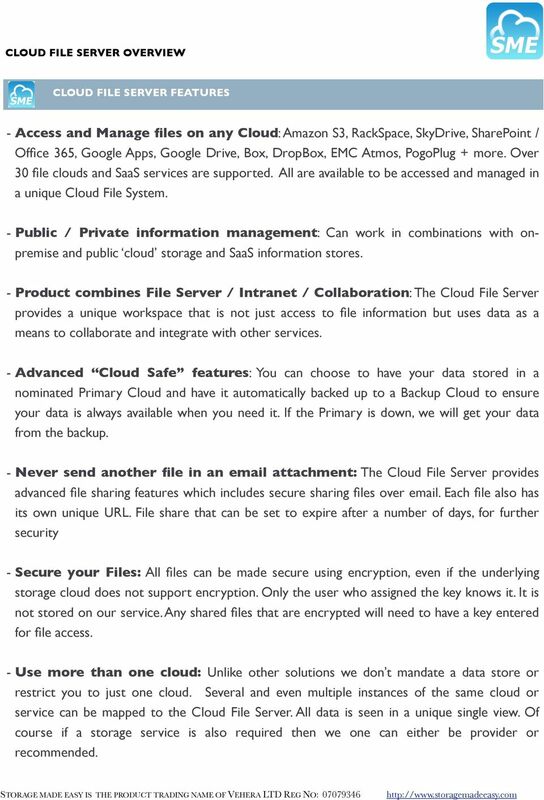 5 - Shared Folders: The Cloud File Server enables special folders to be set that all users in the company can instantly access (dependent on permissions set). This is a great way to store common organization data and ensure that all users have access to company content such as Marketing, HR literature etc. These folders can be exposed from data that is stored on any Cloud or information store that is mapped to the File Server. - Cross Cloud Search: Search for data across all information clouds that are mapped to the Cloud File Server rather than trying to remember where a certain file or piece of information is stored. - Active Directory integration: The Cloud File Server can be integrated with Active Directory so that uses and Groups can be managed directly from Active Directory. - Unify Permissions: The Cloud File Server enables yunified access permissions for access across all Clouds that are mapped and exposed to the user base. - GEO Location Recording: For some companies, where they where when uploading data and where their data is stored is important for legislative purposes. To this end we GEO record any data that is uploaded using the SME Cloud File Server. - Advanced Access: The Cloud File Server exposes all mapped Clouds over FTP, WebDav and Amazon S3 API s even thought the underlying Clouds may not support these API s natively. This enables eases of integration with other Apps and systems that use these API s. - Fax Integration: We integrate with the Interfax service which enables you to send documents as faxes directly from our service. An Interfax account is needed. - BYOD Support: Support for Bring your Own Device and BYOD management and governance. - Avoid Lock In: Not only do we support over 35 Clouds, we enable you to move data from one to the other helping you avoid vendor lock-in. Investor Newsletter. Storage Made Easy Cloud Appliance High Availability Options WHAT IS THE CLOUD APPLIANCE? Data In The Cloud: Who Owns It, and How Do You Get it Back? Data In The Cloud: Who Owns It, and How Do You Get it Back? Presented by Dave Millier, Soban Bhatti, and Oleg Sotnikov 2013 Sentry Metrics Inc. Agenda Reasons for Cloud Adoption How Did My Data Get There?